How often do the children in your life play by spontaneously letting their imagination spur their play time adventures and activities? Play time isn't just about fun and games - through playings kids learn how to interact with others and develop skills critical for childhood development. Some of the important benefits children achieve through play time include improved cognitive abilities, honed communication skills, increased creativity, a better understanding of how to process and express emotions, increased development of coordination, balance and other physical skills and enhanced social skills. Ensuring children get enough play time also can be an important factor in assisting children with problem solving, critical thinking, self expression and imagination. Parents should be aware that child care experts are expressing concerns that today's children are not getting enough play time and that the amount of "unstructured free play" is in decline. Unstructured play is a set of activities that children dream up on their own without adult intervention. This type of play rarely has predetermined goals or objectives but instead allows children to create their own rules and establish their own limits. Common reasons for the decline include safety concerns (stranger danger, crime, traffic), increasing time spent in school and on academic performance, and an emphasis on structured activities (sports, clubs, music lessons, etc.). Recent research suggests that children should experience twice as much unstructured time as structured play experiences and touts the benefits of unstructured play on whole child development. I remember as a child, there were multiple empty lots in our subdivision that were filled with grass grown out to about five feet tall where all the neighborhood kids would congregate to pretend we were jungle explorers, have massive battles with our collections of plastic green army men, or build tracks to race our BMX bicycles. There also was a creek surrounded by some woods and fields where all the kids would go out to explore, build forts, or role play as Star Wars of G.I. JOE characters which were both really popular at the time. We enjoyed what Dr. Michael Patte, a professor of education and child life specialist at Bloomsburg University, calls the "three frees" - free of charge, free to choose, and free to come and go as we pleased. He warns that kids are being overwhelmed by scheduled events and structured activities to the detriment of the development benefits derived from simply engaging in unstructured free play. Dr. Patte recommends parents understand times have changed since they were a kid themselves and encourages adults to make extra efforts to ensure children are getting enough unstructured playtime allowing for the imaginative and physically active play experiences that are vital to healthy child development. Unfortunately, unlike where I grew up, our current neighborhood doesn't have the numerous open spaces or lots of similarly aged children living on the block to entice my kids to get outside and play the way I did when I was their age. 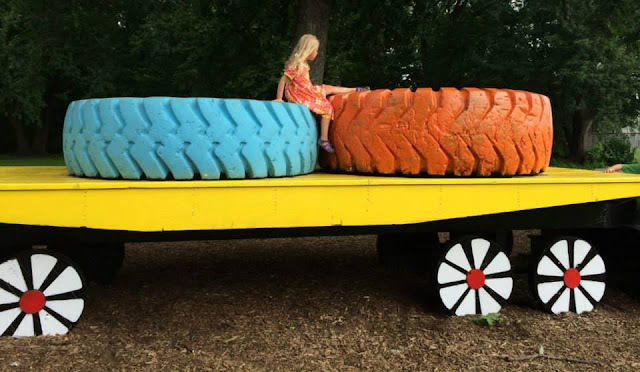 So we've made it a family endeavor to explore the local parks for the most unique and interesting playscapes and frequently visit them to help instill with our kids a desire for wanting to get out and play. They're always excited to go to one of these playscapes and I just sit back on a park bench out of their way and let them play. Some of my kids favorite places to play are Metro Detroit area playscapes with barn, train, and wilderness themes. 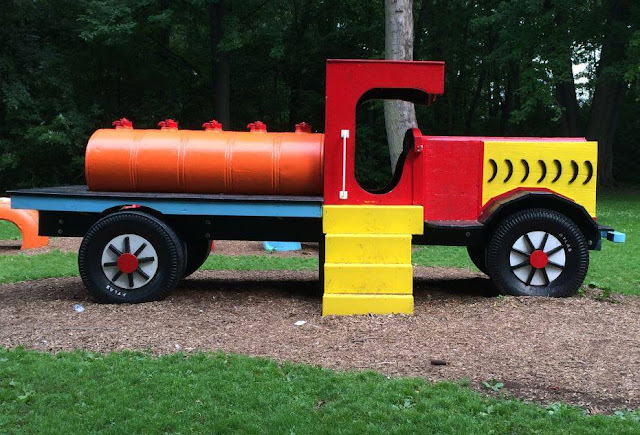 Inglenook Park features a farm themed playscape complete with animal cutouts, two barn shaped towers, a windmill, and numerous features for children to bounce around, climb up, swing on, or slide down. It also has a giant life-sized spider web with a trampoline in the middle for children to climb and bounce on. My kids can spend hours playing here and still not want to leave when I tell them its time to go home. 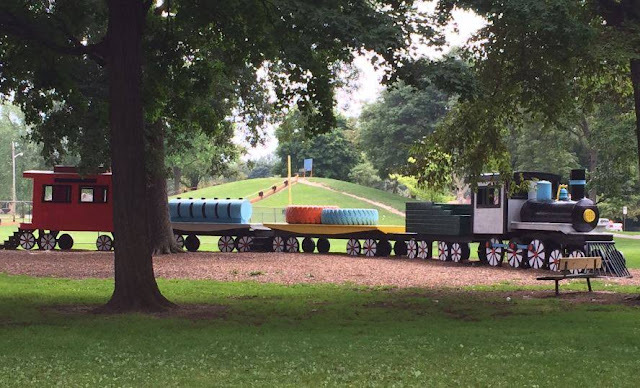 David H. Sheppard Park features life size recreations of a truck, train, and boat for kids to play on. My kids like to imagine themselves having Wild West adventures on the train and pretending to be ocean explorers cruising the seven seas on the tug boat. They can be so creative as they play out some really interesting adventures at this fun park. 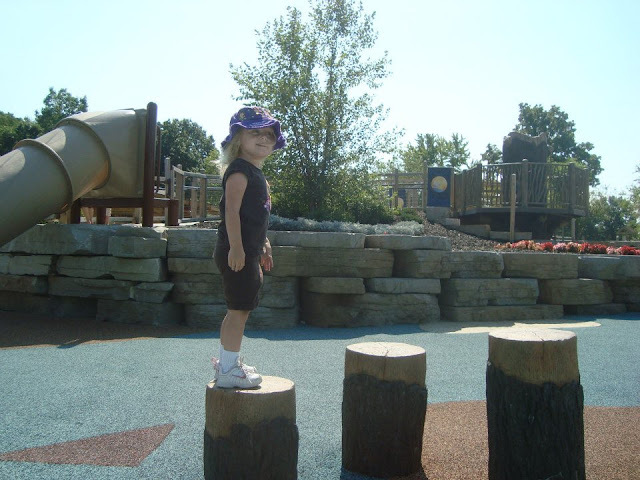 Waterford Oaks County Park's Paradise Peninsula is a Michigan-themed playscape that features an "up north woods" cabin, tree fort, sand dunes area, marsh with cattails, raised sand play area, and multiple climbing areas. Colorful rubberized surfacing depicts Michigan's lakes, dunes, and forests. 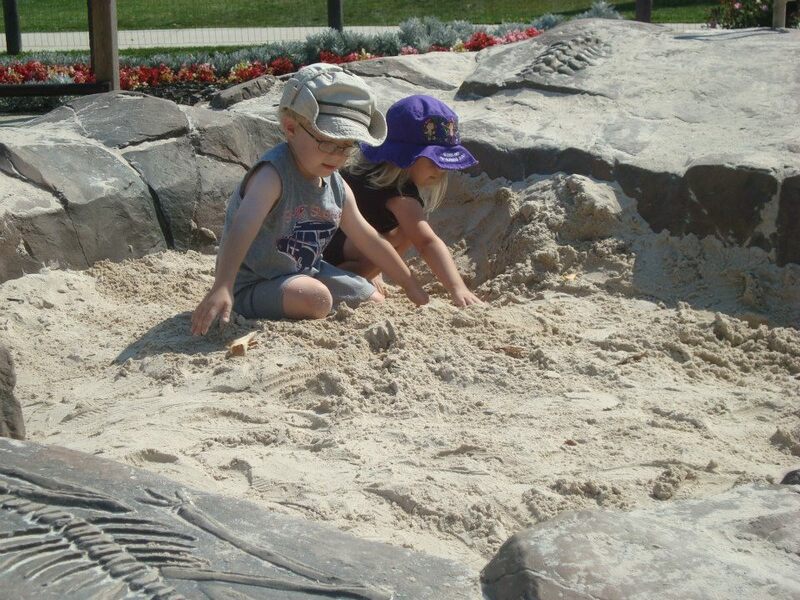 My kids enjoy "rock climbing" the simulated cliff features, pretending to be on a camping expeditions using the log cabin, tree fort and row boat, and searching for the faux fossils placed around the play area. Visiting a playscape is always a learning experience when it comes to social interactions because most of these cool locations are somewhat of a drive away from our house so my kids are always meeting new children to play with. It's a great opportunity for them to get over being shy and developing socializing skills when it comes to meeting new people. Sometimes there will be a child on the playground who is a bully, temperamental or just not very nice to be around and these situations also present "teachable moments" for the kids. Learning how to make new friends and dealing with people who don't want to be your friend are two valuable skills to have in life. More importantly, spending time at a playscape gives my kids the opportunity to be creative through unstructured imaginative play and has them being physically active. 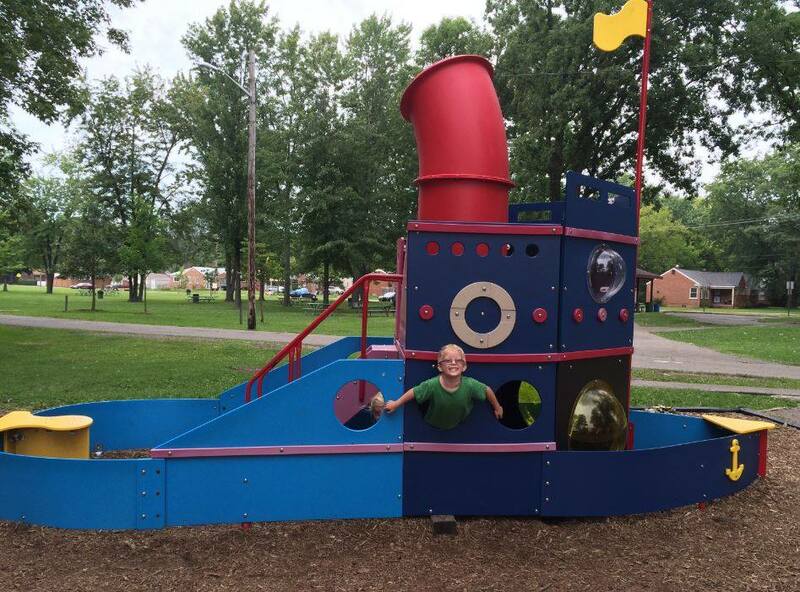 Once the kids hit the playscape, you never know what pretend adventures they may embark on or characters they might role play. On our last few visits, I've observed my children make new friends and really be imaginative with their play while pretending to be dinosaurs, role playing Star Wars adventures, and engaging in a game of tag with each participant pretending they were a different wild animal. Plus a playscape provides obstacles and features that enhance imaginative play and get children running, climbing, jumping sliding. With the American Heart Association recommending that children 2 and older should be involved in at least 60 minutes of moderate intensity physical activities each day to stay in good health that absolutely makes a visit to a playscape a good thing. Join A Geek Daddy in taking the "Play Pledge" that you will make it a priority to encourage your kids to engage in unstructured imaginative play on the Genius of Play website. If the website obtains a commitment from parents to support a million hours of play time for their children, the Toy Industry Association will donate $10,000 worth of toys to the Toy Bank, an international giving program that makes play possible for children in need around the world. CLICK HERE to make the Pledge by submitting your email address and selecting the number of hours between 1 and 40 per week your family will devote to making time for your children to play. Taking the "Play Pledge" is your acknowledgment as a parent that you recognize the importance of play to a child's development and commit to ensuring that your child gets enough quality play time in their life. 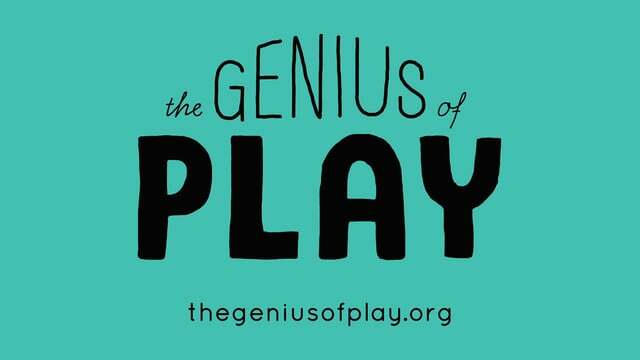 When submitting your "Play Pledge" you can opt-in or out of receiving a monthly The Genius of Play newsletter filled with play ideas and tips from the Toy Industry Association. The Toy Industry Association (TIA) is the not-for-profit trade association whose members include toy inventors, toy makers, toy sellers, and all other businesses involved in creating and delivering toys for kids of all ages. TIA's 750+ member companies are responsible for about 90% of the estimated 3 billion toys sold in the U.S. every year. The TIA's Genius of Play campaign provides families with the information and inspiration they need to make play an important part of their child’s day. Through its website and social media channels, parents can find facts, useful tips and expert advice on how toys and play can help kids build confidence, creativity, critical thinking and other skills that will serve them throughout their lives. Plus, you can get ideas on how to keep playtime fun and fresh! You can follow The Toy Industry Association on Facebook, Twitter, Instagram and Pinterest.